Private mortgage insurance or FHA-insured? Mortgage insurance from Genworth may provide more benefits. Discover the advantages of Genworth MI and why it may be the better choice for you and your borrowers. Comparisons based on $200,000 loan amount and Genworth national fixed rate mortgage insurance premiums (for 2 borrowers and DTI <45%). *Assumes .375% additional rate to cover GSE fees. **Lenders and borrowers should review investor guidelines regarding cancellability of MI. A side-by-side comparison of a 97% LTV loan between FHA and Genworth. 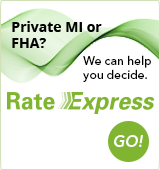 See how Genworth MI and Home Possible or HomeReady stack up for your borrowers versus FHA. Don’t gamble on your loan originations.